You'll notice a distinct improvement in picture quality as my new camera arrived just prior to the weekend. I am quite the snap-happy-chappy these days. Anyway, dipping back into the Northern Premier League for this weekend's effort, at Witton Albion. I had earmarked this a long while ago as a way to catch up with ex-H&W defender Christian Hanson who was reported to be plying his trade with Spennymoor. His playing for us was quite ludicrous as it involved him travelling from Middlesbrough. Are there many even in the pro leagues who make that kind of trip? I doubt it. 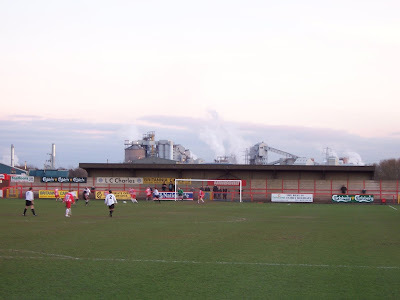 So Spennymoor must have made much more logistical sense. As it turns out though, since I picked this one, he's been given his chance in the pro game again, with Port Vale. Best of luck to him, his tenure in the Hawk defence is remembered fondly. 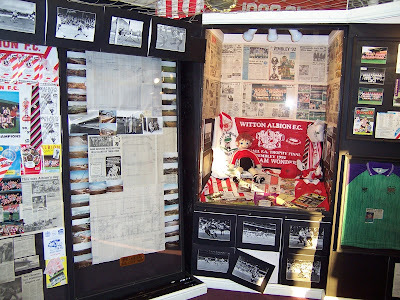 In his place a lanky player I think named Gough gets the majority of the abuse Witton are eager to dish out. Of course these are the times, when the crowd are on your back (and seemingly your back alone) that when you swing a big hoof at the ball, you miss and allow the ball to bounce under you and back up into your arse. Great days. As always, I am always rather taken with the downtrodden and was pleased, in the end, that his was the last laugh as the Moors won it. 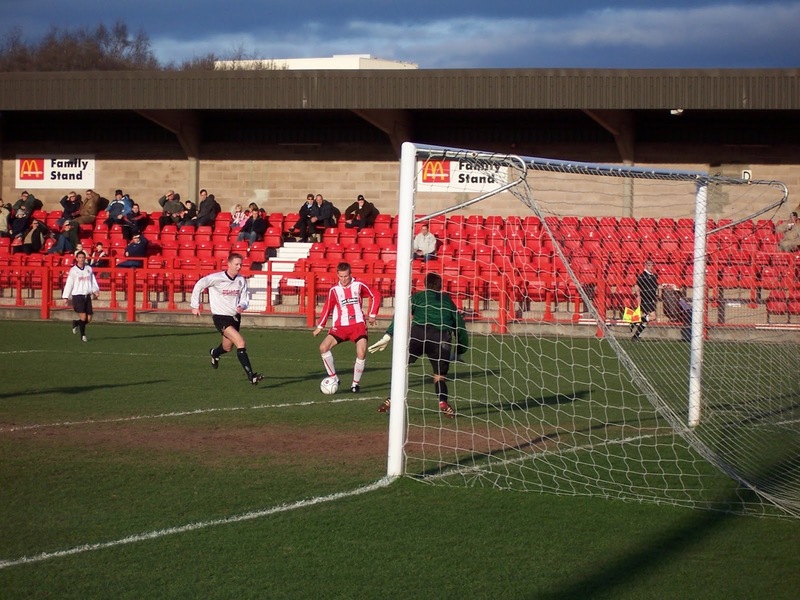 Indeed, he took great pleasure in turning to the Witton fans and shouting 'C'mon on, har har', which suggested he was some kind of maniacal pirate high on plunder. Of course, that image might have been down to his eye-patch and wooden leg. Arf. I do find it utterly baffling when fans, having hurled abuse at a player for 90 minutes, react with such indignation when they give some back. I've seen in the past people squinnying to stewards to have something done about 'this disgrace of a player'. Crazy. I'd rather fans were vocal though, makes for much more entertainment to the neutral. I did like Wincham Park, a very tidy ground with cover on all four sides and a long stand. 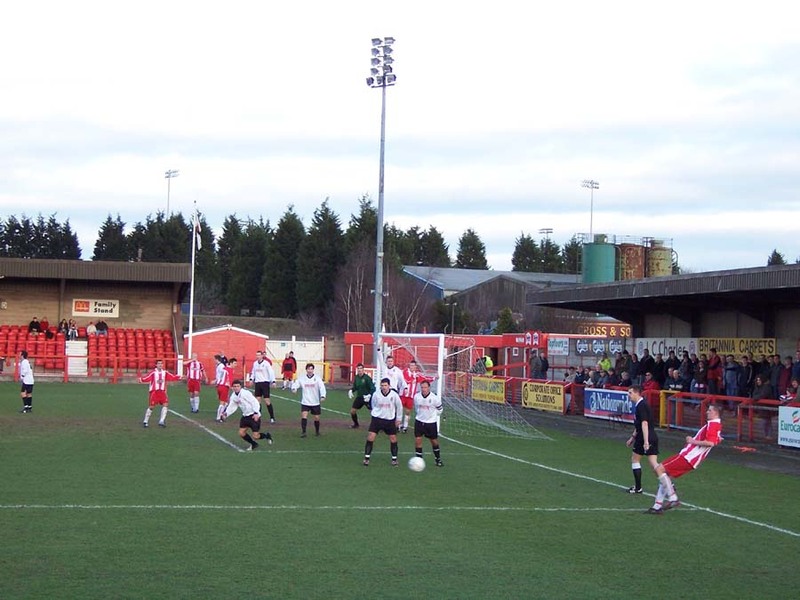 It's easy to see why this ground qualifies for Conference football. 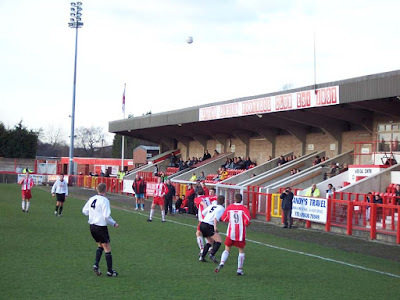 Indeed, the Conf's Northwich Victoria are currently sharing this ground while their new one is built along the road. You can see what I think is the floodlights of the new Victoria Stadium peeping above the trees in the second photo at the top of this post. I wonder how each clubs attendances will pan out over the course of the coming years with the two venues being so close by. 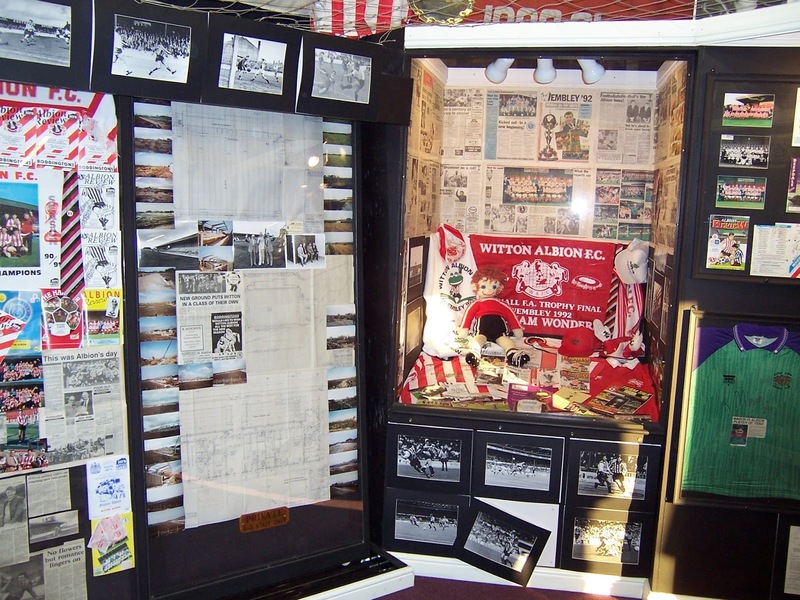 Another nice innovation was the presence within the club shop of a small museum of old programmes, photographs, player contracts from the 40's, and lots of memorabilia concerning their trip to Wembley for an FA Trophy final about a decade ago. All clubs should do it, I reckon. Hoarders of the world, unite and exhibit.